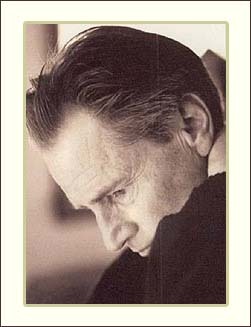 If anyone knows what it takes to be a man, it should be Sam Shepard. For 30 years he has stood as the maverick of American theater, pounding out two-fisted tales about the Wild West, fast cars and rock 'n' roll. In 1983's "The Right Stuff," he portrayed test pilot Chuck Yeager with uncommon familiarity, marching proudly from the wreckage of a crash that would kill any mortal being, his face blackened with ash, his helmet firmly tucked under his arm. When asked Thursday afternoon for his definition of a real man, Shepard flinched. "I don't feel like giving that right now," he said, wiping his weathered face with a long hand. "I know what it isn't: The stuff that's offered up in beer commercials. What? What? Bud Light? I can't believe men are duped by this. Do you have to take a six-pack everywhere you go? Wear your baseball cap backward?" Shepard's low-key, no-nonsense appearance Thursday at the University of Minnesota's Rarig Center was designed so students could ask one of the nation's most challenging playwrights about the theater. But it may have been more satisfying simply to hear the renegade artist chew the fat. In the world according to Shepard, e-mail is evil. Modern machines, including the tape recorder, are to be avoided. "Rent," the current toast of New York theater, lost its reason for being the moment it appeared on the cover of Newsweek. He has little use for Broadway, where a revival of his play "Buried Child," which won the Pulitzer Prize in 1979, is running to rave reviews. It is the first time a Shepard play has appeared on Broadway, which has more to do with director Gary Sinise's massive production than with Shepard's desire to see his name in lights. "It's a tourist deal," he said, dressed in a dark-blue sweatshirt, a casual vest and faded blue jeans. " `Cats' on one side of the street, `Phantom' on the other. There's nothing wrong with that. But I don't see where my plays fit." Shepard, 52, has made few appearances in town despite the fact that he and Minnesota native Lange moved to Stillwater with their family last year. He has not seen any plays here and didn't seem terribly interested in one student's suggestion to work with the Guthrie Theater. When another student asked the playwright about how to deal with plot, Shepard said he has little use for it. "I saw a film last night," he said. "Guess I missed it when it was around before. It was called, `Usual' . . . uhhh. . . . "
" `Suspects'!" cried several students.
" `Usual Suspects.' It had an unbelievable plot," he said, squinting. "But I'm thinking: Is that as interesting as following a character?" After the session, Shepard continued to chat with students outdoors, smoking and sipping on a can of Coke. "It was nice to see him as a human being, because you put this kind of person on a pedestal," said Shannon Farrell, a 23-year-old theater arts major. "I was just amazed he came. He's such an isolationist."